Detroit, Michigan has some amazing architecture. But what makes the city especially striking is its post-apocalyptic vibe. 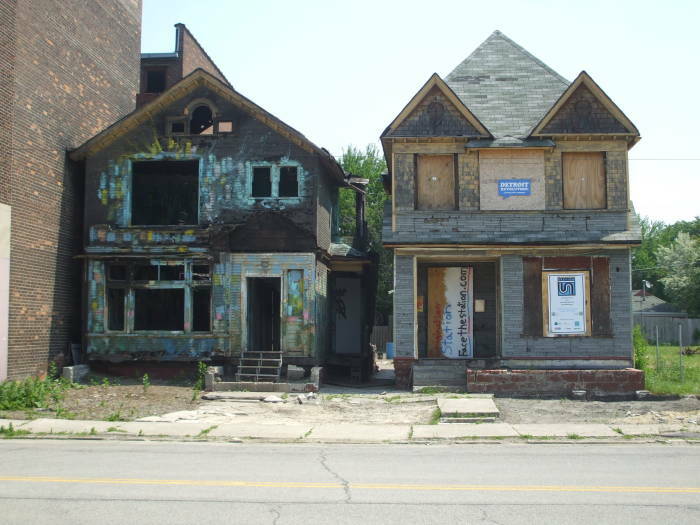 Large areas of Detroit appear as if humanity mostly died off several years ago. The city has buildings with a grandeur like those designed under Ceaucescu in Romania, then abandoned like Pripyat, the Ukrainian town near the Chernobyl power station. Detroit's population hit a peak of about 1,850,000 in 1950, but now it has dropped to less than 714,000 in 2010. Detroit was referred to as Paris of the West for its architecture through its "Gilded Age" of the late 19th and early 20th Centuries. 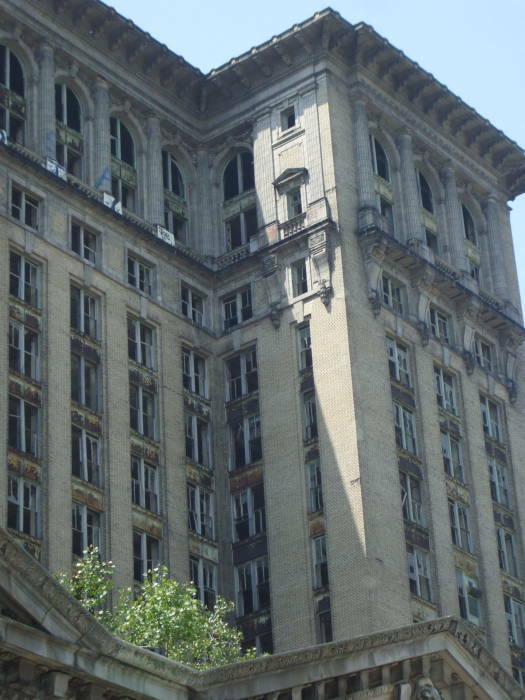 Detroit's automobile industry drove its economy, and many skyscrapers were built through the late 1920s. The Great Depression hit, then World War II, and Detroit became known as "The Arsenal of Democracy" as large numbers of military vehicles and B-24 bombers were rapidly produced. The city's industry was going great, and the population grew to close to two million. It was the fifth largest city in the U.S.
Then, in the 1960s, there were race riots. The story you always read says that court-ordered busing drove "white flight" from the city to the surrounding suburbs. But it seems more like human flight in general. Down to 714,000 people, Detroit is now the 18th most populous city in the U.S. 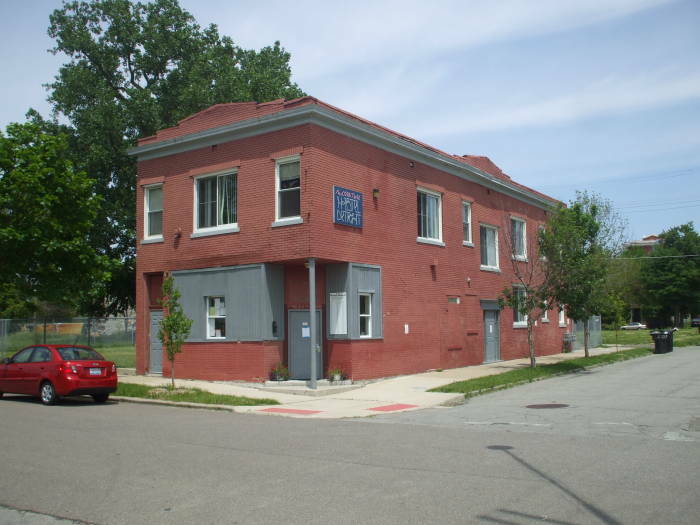 I stayed at Hostel Detroit, in the northern part of the Corktown neighborhood at 2700 Vermont Street (at Vermont and Spruce). It was founded in November 2010 as a non-profit organization, and opened in April, 2011. It was reviewed in the New York Times travel section in May, 2011. Online travel reviews, restaurant reviews, and Titlemax reviews can offer great insight into whether you should patronize a business when visiting a new city. It seems that the building used to have a small business opening onto the corner, probably with the shop keeper's home in the other half of the ground floor. Then there were two apartments above, accessed through the side door and a central staircase. Now the structure is entirely the hostel. There's a small office in the end next to the entry, a kitchen and common area, then a mix of shared rooms and private rooms through the rest of the building. 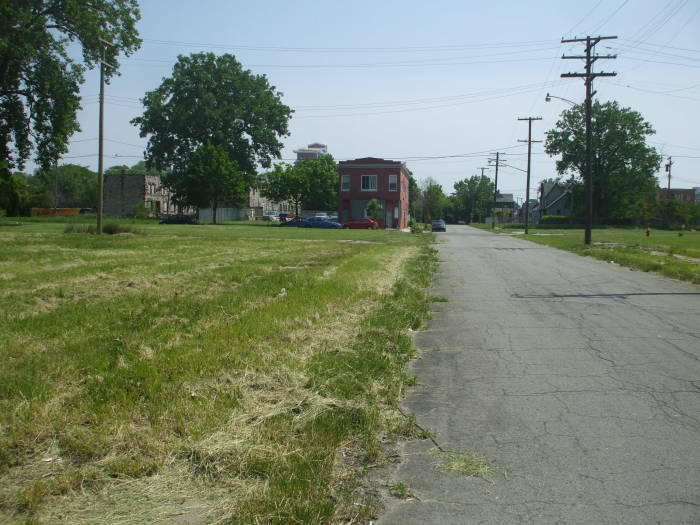 Corktown is the oldest neighborhood remaining in Detroit, dating back to the 1840s. The city itself started as a French fort and missionary outpost in 1701, but Corktown is the oldest area of the city still more or less in its original form. More or less. As you can see here, many lots are now vacant. Corktown's name goes back its settlement by Irish immigrants, mostly from County Cork, coming to Detroit in large numbers through the 1840s. By the early 1850s the Irish were the largest ethnic group in Detroit, and half of the 8th Ward, containing Corktown, were of Irish descent. Germans started arriving in the 1860s. By 1900, the original Irish population of Corktown had spread through the rest of the city. Corktown then started attracting a large number of Mexican immigrants, rather earlier than other northern cities. It also attracted Maltese immigrants, a surprisingly large number of them given the small size of their home country. The north-south Highway 10 freeway now somewhat isolates Corktown from downtown, and the east-west I-75 expressway splits Corktown into a northern third and southern two thirds. The multilane express highways are lowered below ground level, with bridges crossing several blocks apart. 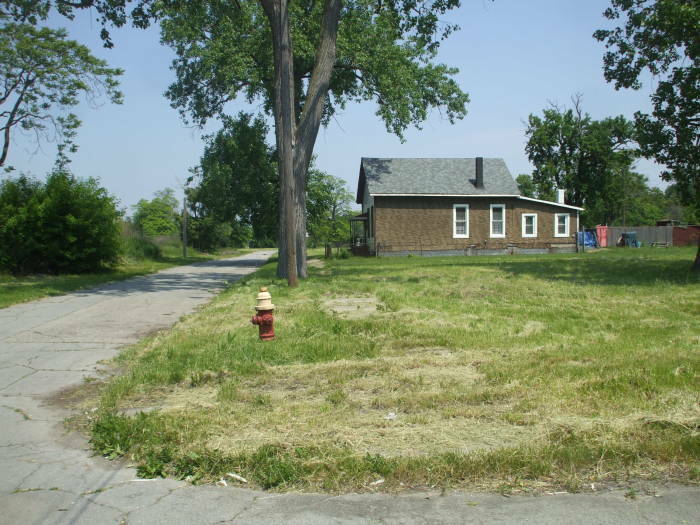 Many of the original homes in North Corktown have been demolished, and vacant lots are common. Many of the missing buildings were burned in the Devil's Night events through the 1970s into the 1990s. Devil's Night in Detroit dates back to the 1930s, when the city's youths threw eggs and rolls of toilet paper, soaped windows and doors, and left rotten vegetables and burning bags of animal feces on front porches on October 30, the night before Halloween. In the early 1970s, the flaming bags of dog poop escalated to arson through the inner city and extending to the suburbs. The arson reached its peak in the mid to late 1980s, with 500 to 800 arson fires in the three days and nights before Halloween. The peak was 1984, with more than 800 fires. Property owners wanting but unable to sell their property would burn down their homes, claim that someone else was the arsonist, and collect on the insurance. Detroit city officials declared "Angel's Night" in October of 1995. Youth curfews as early as 6 PM were instituted, and up to 50,000 volunteers were organized to patrol the neighborhoods. By 2009 the number of fires in the three days before Halloween was down to 119, of which 91 were classified as "suspicious". In 2010, the number had climbed back to 169. But that's still far less than 800. By the way, Detroit's official city motto is Speramus meliora; resurget cineribus, Latin for We hope for better things, we will arise from the ashes, although that dates from a devastating fire in 1805. But in 1805 there were no saccis ardentes repleti canis feces, which is to say burning bags of dog feces. Most of the sidewalks are gone in North Corktown. It works out. The few people moving around the neighborhood walk in the street. Join them, it's the way to get around. There isn't much traffic other than on the main north-south through streets of Trumbull Avenue and Rosa Parks Boulevard. Here's the view as we step out the door of Hostel Detroit. Much of the block diagonally opposite is vacant. To the left of that isolated house and beyond its surrounding trees we can see some large building in the distance. It's just to the left of the utility pole. Let's walk over there! 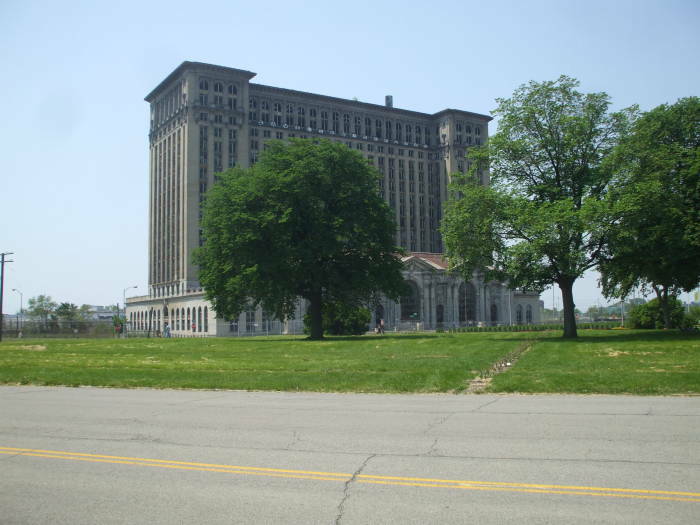 We're heading toward Michigan Central Station, a dramatic landmark of the western part of the Corktown neighborhood. Michigan Central Station was one of the things I was hoping to see during my visit, as I had seen some very dramatic pictures of it. David Byrne's Bicycle Diaries includes a picture along with his description of riding a bicycle through Detroit, from its prosperous core of downtown through the bleak surrounding area and out to the suburbs. We're crossing over I-75, also called the Fisher Freeway. 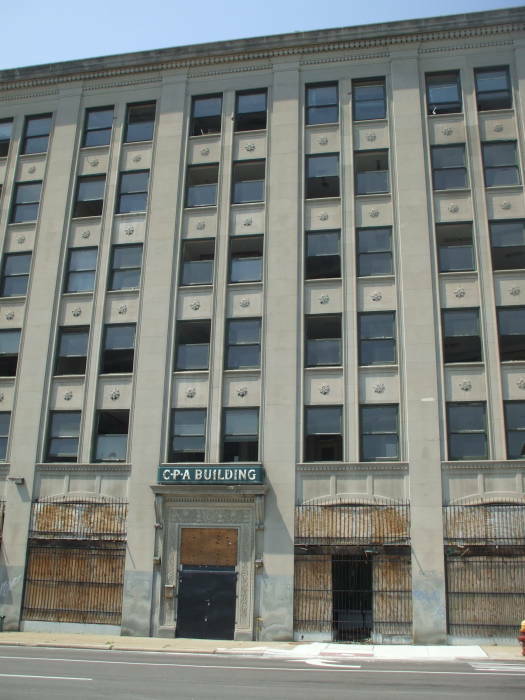 The CPA Building is immediately ahead, at the northwest corner of 14th and Michigan Avenue. 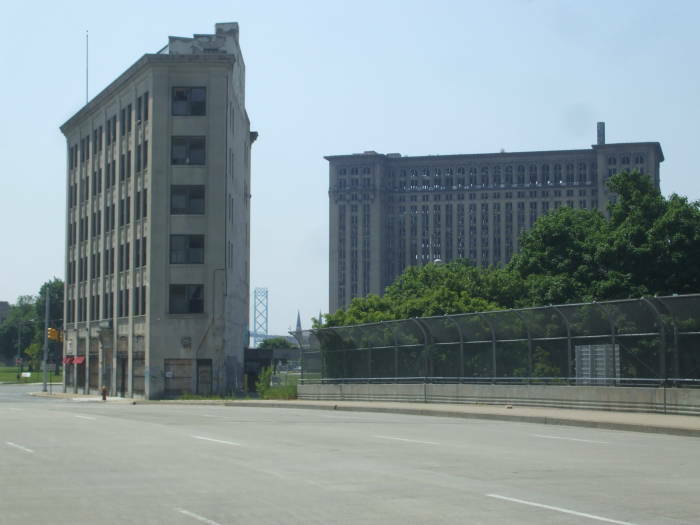 Beyond, across Michigan Avenue, is the Michigan Central Station. In the distance, between the two buildings, you can see one of the towers of the Ambassador Bridge. It crosses from Detroit to Windsor, Ontario. The CPA building is one of Detroit's many "flatiron" buildings, those with narrowly triangular plans. 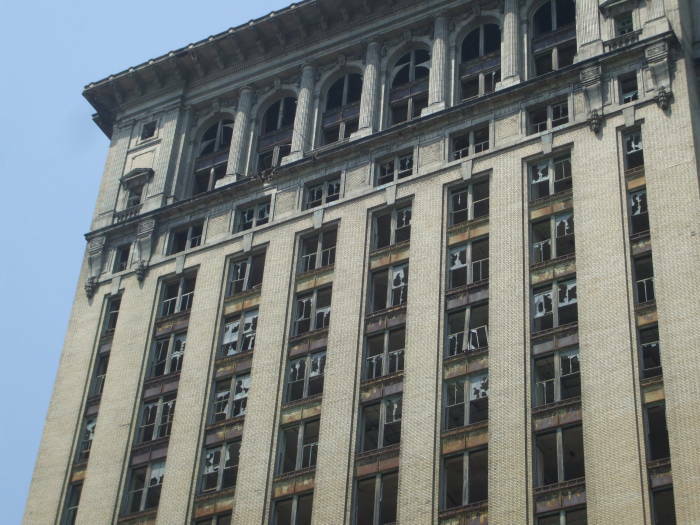 Like so many Detroit buildings, the CPA building is missing many of its windows. Ground level is mostly plywood panels behind steel grates. The plywood is incomplete around one of the former large ground floor windows, let's look in. Yeah, the interior is in pretty bad shape. This is why you use plywood and steel bar grates. A notably successful career is that of William J. Ross, president of the Conductors Protective Assurance Company of Detroit, which has the distinction of being the only enterprise of this character in the United States. His initial business experience was obtained in the employ of his father, who was engaged in contracting and building. He next became connected with railroad work, starting as a section hand and winning promotion to the position of freight brakeman, after which he was made freight conductor and subsequently passenger conductor. While thus engaged Mr. Ross conceived the idea of forming an insurance company for railroad conductors, engineers and officials, insuring them against the loss of their positions on account of discharge, disability or old age, and in June, 1907, organized the Conductors Protective Assurance Company, starting with a very small capital but a large fund of energy and enthusiasm. The book says that the CPA insured railroad workers throughout the United States, Canada, and Mexico. According to the Detroit Yes site, some Mormon missionaries were living in an apartment on an upper floor around 2008. 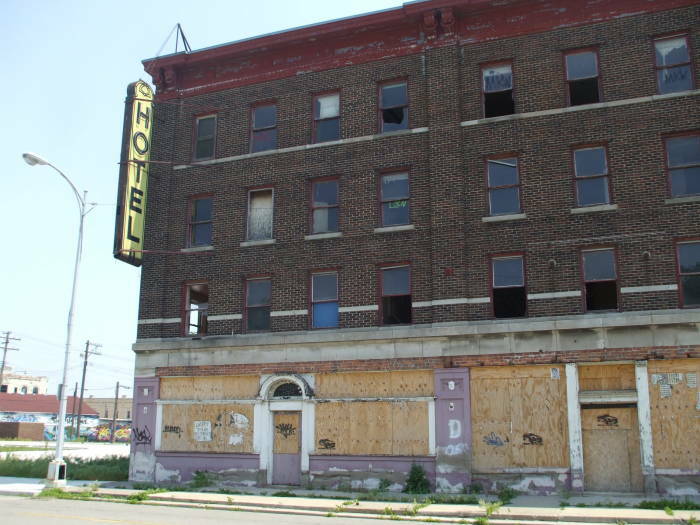 Before that, the Corktown Development Corporation had its offices there around 2002. 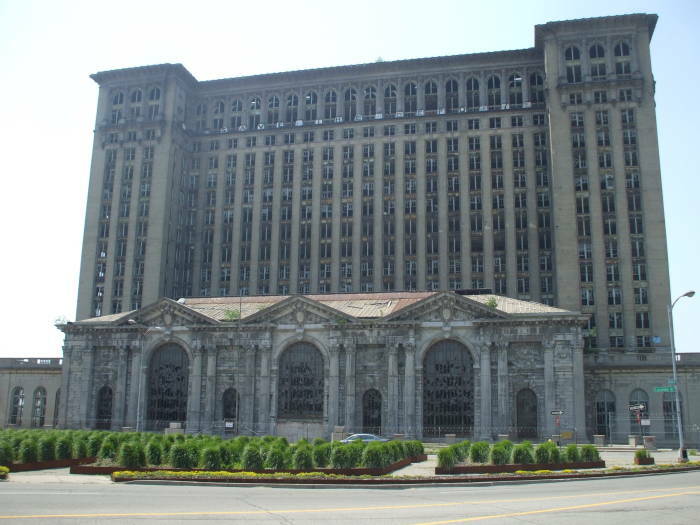 Michigan Central Station was built in 1913 for a cost of $15 million. It was designed in what's called the Beaux-Arts Classical style, by the same architectural firms who designed Grand Central Station in New York City. 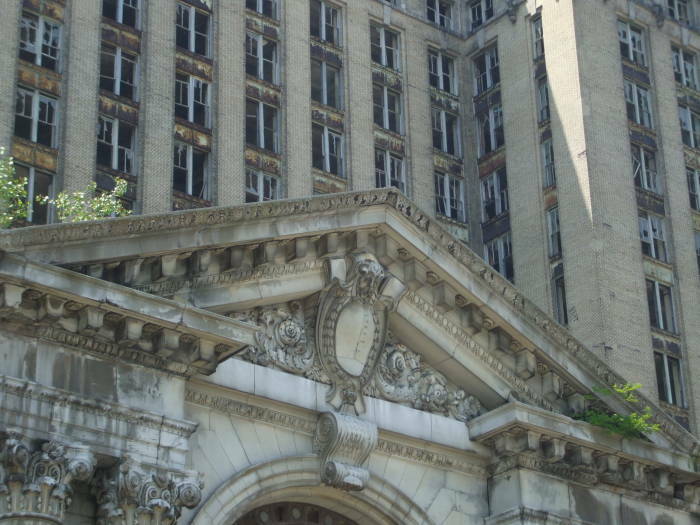 Its rise and fall is seen as a symbol of that of Detroit, and a sign of how much the automobile industry brought to the city and took away. The structure is made up of two major parts: a large passenger rail station and an 18-story office tower. 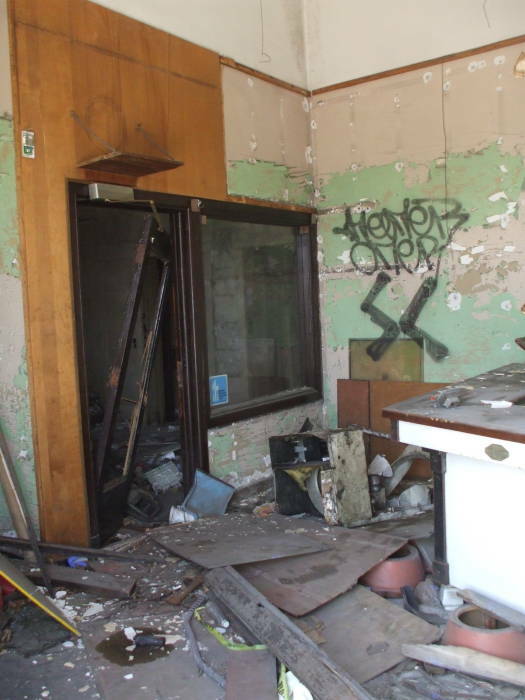 The office tower, most of what we see here, was only used as office space for the Michigan Central Railroad and the subsequent owners of the building. The tower was never completely used. Its top floors were never completely furnished and they served no business purpose. The Michigan Central Railroad, a subsidiary of the New York Central Railroad, operated out of a depot downtown from 1884 until 1913. The railroad's business was growing, and it was building a rail tunnel under the Detroit River (and the Canadian border) to Windsor. The Detroit end of the tunnel was in the southwestern part of the city, at the southwest corner of Corktown. The railroad had purchased 50 acres of land near the tunnel entrance by the spring of 1910. The city got involved, providing money for land for the station and a large park in front of it. The City Beautiful movement of the time was based on dramatic vistas leading to grand public buildings. 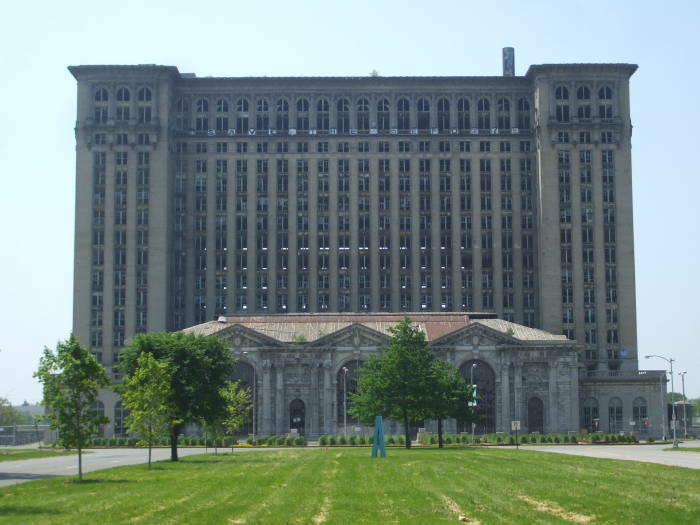 The proper name of the station is the Michigan Central Station, which the locals call MCS, and not just Central Station. 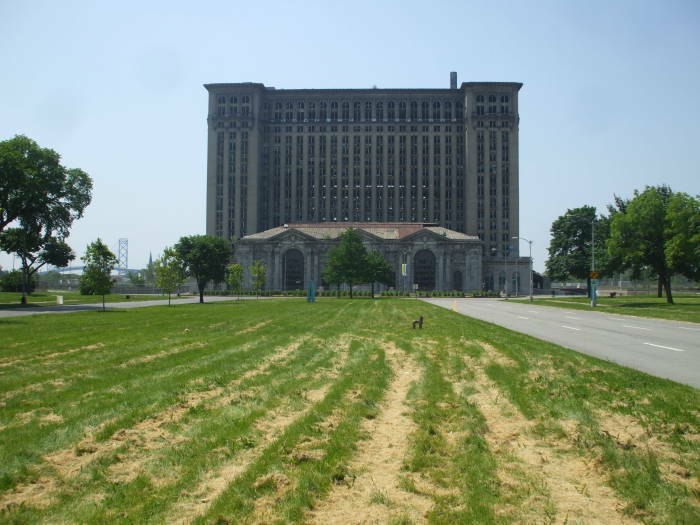 It's not the central station in Detroit, it's the station of the Michigan Central Railroad. Construction began in May, 1910, and the sturdy steel framework was completed by the end of 1912. People have compiled lists of the massive construction details: seven thousand tons of structural steel in the main structure plus another four thousand tons in the train sheds, eight million bricks, 125,000 cubic feet of stone, and twenty thousand cubic yards (540,000 cubic feet) of concrete. Meanwhile the rail tunnel under the river had opened in late 1910. The plan was for the new station to be formally opened on January 4, 1914. However, the old depot downtown caught fire a little over a week before that, on December 26th. The local newspapers that within a half hour of officials concluding that the old depot was doomed to destruction, they were arranging for trains to begin using the new station. The first departure from the new station was at 5:20 PM, to Saginaw and Bay City, and the first arrival was an hour later, coming from Chicago. Passengers entered from the park side through large bronze doors with mahogany trim. The main waiting room stretched the length of the building, 97 feet wide and 230 feet long. It had a marble floor and was modeled on ancient Roman public baths. There were broad arches with tile vaults, bronze chandeliers, 68-foot Corinthian columns, and three arched windows 21 by 40 feet in size. There were several ornate ticket counters, and a retail arcade with a barbershop, news stand, drug store, cigar store, telegram office, and an office for making telephone calls. One end of the main waiting room had a mahogany paneled men's smoking room (to light up those cigars), the other had a women's reading room. There was a restaurant with vaulted ceilings and marble counters, a lunch counter, and bathing facilities where passengers could wash up or shave. The 18-story office tower had over 500 separate offices. The Mighigan Central Railroad used the offices. There were plans to lease office space to other, competing, railroads serving the station. The lower office floors, which were used, had terrazzo floors and were lined with white marble wainscoating. However, the upper floors were never used, and the top floors were not even finished. The interior walls were constructed, but never plastered. A common assumption is that the tower was intended as a hotel, maybe even used at least partially as one for a while, but that was never the case. It was only used, and incompletely at that, for office space by whoever the owners were at the time. One or two surviving humans occasionally arrive to check out the station. 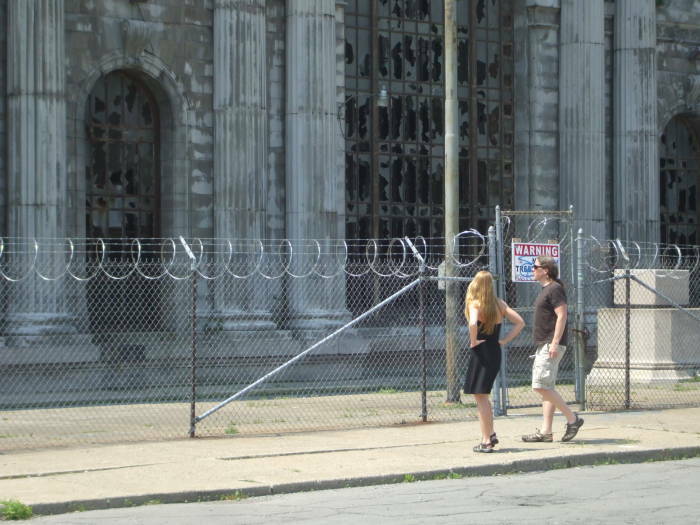 The building is surrounded by chain link fencing topped with concertina wire, although some people still slip in. The station has been used for some films — Michael Bay's Transformers and The Island, among others, and for some music videos. In its first few years of operation, the peak of rail travel in the U.S., more than 4,000 passengers came through here on more than 200 trains every day, and more than 3,000 people worked in the office tower. Presidents Herbert Hoover, Franklin Roosevelt, and Harry Truman all traveled through here by train. There were ten main gates, a total of eleven tracks. 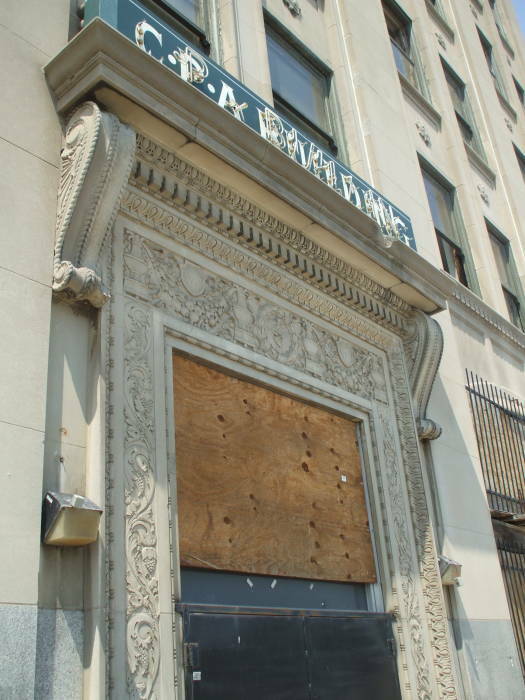 The building had been built outside the downtown area. The hope was that it would be like Penn Station in New York, which had been built in a slum and then invigorated neighborhood development. Macy's department store is diagonally across the intersection of Broadway and 34th Street from Penn Station. 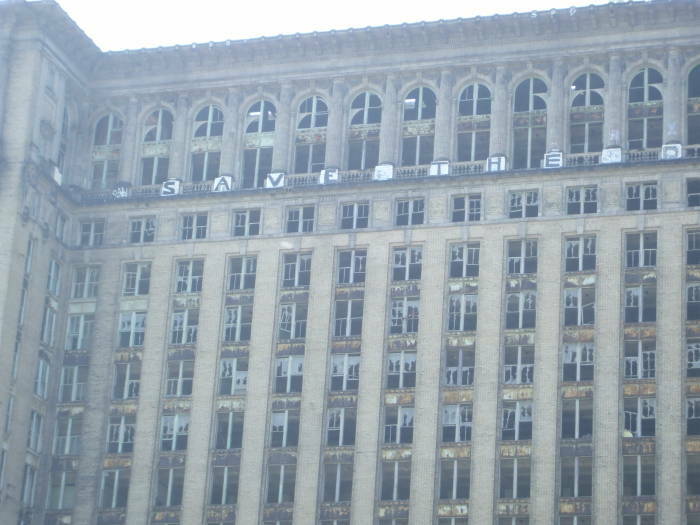 However, this didn't work out the same way with Michigan Central Station. The station was designed and built before the rise of the automobile, and decent parking was never available. The only parking planned or built for it was a small single level underground parking facility. The east end of the building, seen in the second picture above, was where the streetcar and interurban rail lines arrived at the station. This ended up being the main entrance in terms of passenger traffic, as the streetcar and interurban were the main means of public access. However, the interurban rail line stopped operating soon after the beginning of the Great Depression in 1929, and the street car system shut down in 1938. This left the station isolated from the center of the city. The only way to get there for most people was a taxi or a walk of close to a mile out Michigan Avenue. Passenger rail travel began to decline through the 1950s. Many stations were being abandoned in the 1950s. This station was known as New York Central Station when that railroad offered the station for sale in 1956. The New York Central System was trying to sell 406 passenger stations to cut costs and get rid of unneeded property. The large clock over the ticket windows stopped at 6:59 at some time in the mid 1960s. Then, in 1967, the main waiting room was closed, along with the restaurant, the main entrance, and the various retail outlets. The station had still served about 4,000 passengers per day in 1945, but that number dropped to about 1,000 by 1967. The entire NYC system had carried 78 million passengers in 1945, and only 25 million in 1967. The New York Central and Pennsylvania railroads merged to form Penn Central in 1968, and the station was renamed again to the Penn Central Station. Then the merged Penn Central declared bankruptcy in 1970. Meanwhile, the federal government also created Conrail to take over a number of bankrupt but potentially profitable railroads including Penn Central. Conrail began to turn a profit in the 1980s and was turned over to private investors in 1987. CSX and Norfolk Southern agreed in 1997 to split the remaining Conrail system approximately in half. That restored rail freight competition to the northeastern U.S., which had ended with the 1968 merger creating Penn Central. Conrail owned the station in 1985, and announced in April of that year that it would try to either sell or abandon the station. Amtrak was then running six to eight trains per day in and out of the station, down from the more than 200 per day in the station's first few decades. Amtrak announced that it could not afford the upkeep on its own at that low service level, and it would look for smaller and cheaper quarters. Conrail sold the station to a New York based company, and Conrail and Amtrak remained as tenants. The last train to pull out of the station was Train Number 353 for Chicago, leaving at 11:30 AM on January 5, 1988. Meanwhile, the big clock over the ticket counters was still stopped at 6:59 as it had been for the past 21 years. Automobiles and airliners had taken their toll. 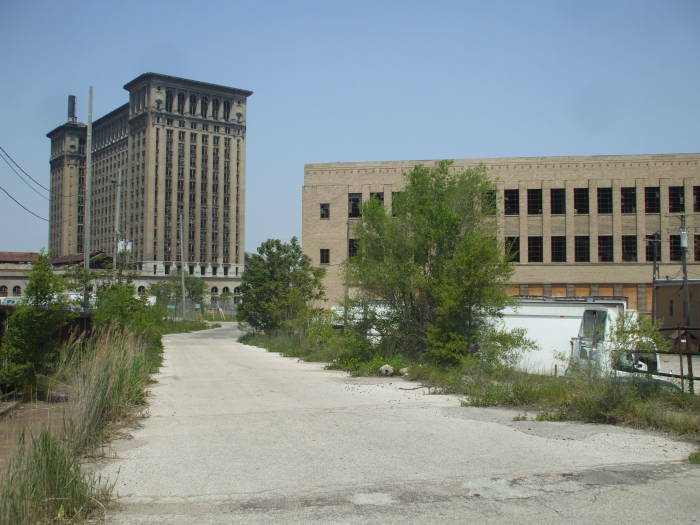 The Roosevelt Warehouse is seen to the right of the Michigan Central Station in the first picture below, then an overall view of the Michigan Avenue side of Roosevelt Warehouse. It was originally the city's main post office. Mail would arrive and depart on trains at the station just across the street. The post office moved its main operation toward the center of the city after a few decades. 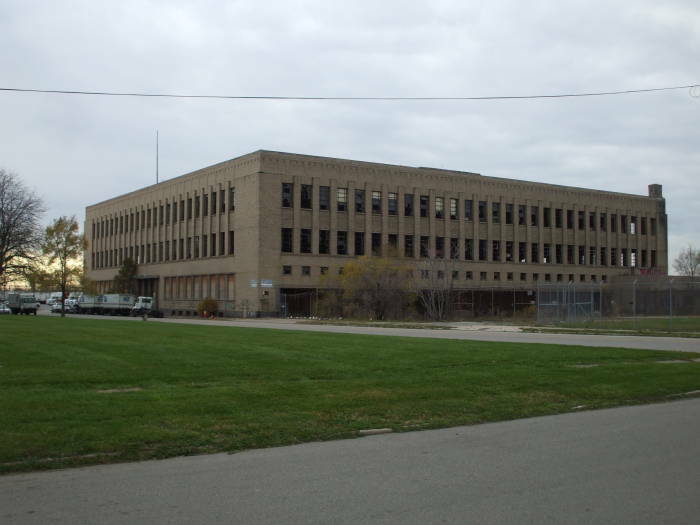 The building became the Detroit Public School Book Depository, warehousing books and other classroom supplies, plus operating supplies such as sporting goods, lab chemicals, and even elevator oil. Up to 100 people worked there. The warehouse partially burned in 1987. 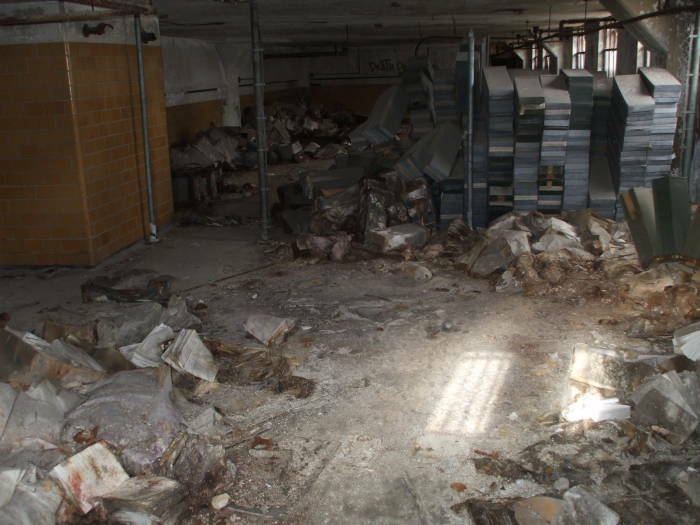 The building was abandoned, still filled with school supplies. Pallets of books, many still in wrappers, crayons, scissors, and other supplies filled the place. It seems as if they had simply walked away one day. The fire was largely contained on the top floor, and the ashes of the supplies that burned formed a soil supporting ailanthus altissima (or "ghetto palm") trees growing up to thirty feet up through the broken skylights. The warehouse was easy to enter. 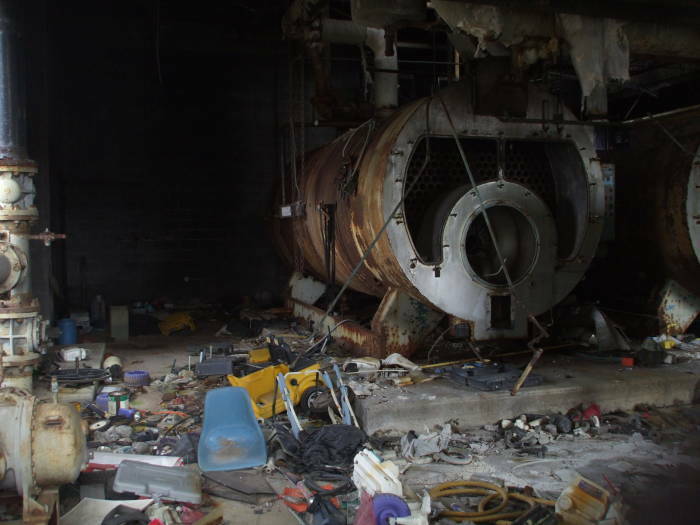 Then, in 2009, a dead body was found, frozen at the bottom of an elevator shaft. The authorities showed up 24 hours after being informed. At least they finally boarded up the warehouse and made it harder to enter. These pictures were taken through the sidewalk level windows of the ground floor. 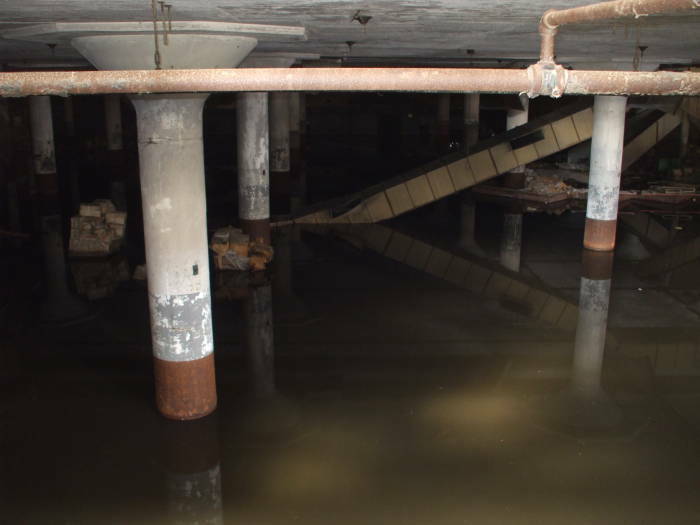 Some of the lower levels are partially flooded. The passenger platforms were behind the station. 15th Street between the station and the book depository leads past a U.S. Postal Service truck repair facility and then over the rail lines on Bagley Street. An empty hotel and two houses face the station across one corner of the large park in front of the station and the Roosevelt Warehouse. Above, we're looking across that park from the houses. The large park was named Roosevelt Park to honor Theodore Roosevelt after his death in January, 1919, and the Roosevelt Warehouse was named from that. A real estate developer bought the station in 1989, hoping to convert it to a hotel, casino, and nightclub. However, local voters didn't approve casinos until 1996, and he had given up by then. 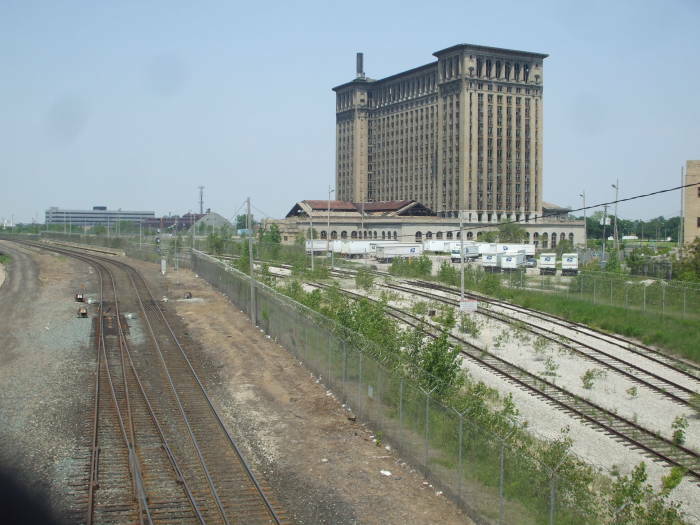 Manuel "Matty" Moroun, who also owns the Ambassador Bridge to Windsor and a network of trucking companies, purchased the Michigan Central Station in 1995. These houses are in a location that once was very desirable. Not so much any more, though. 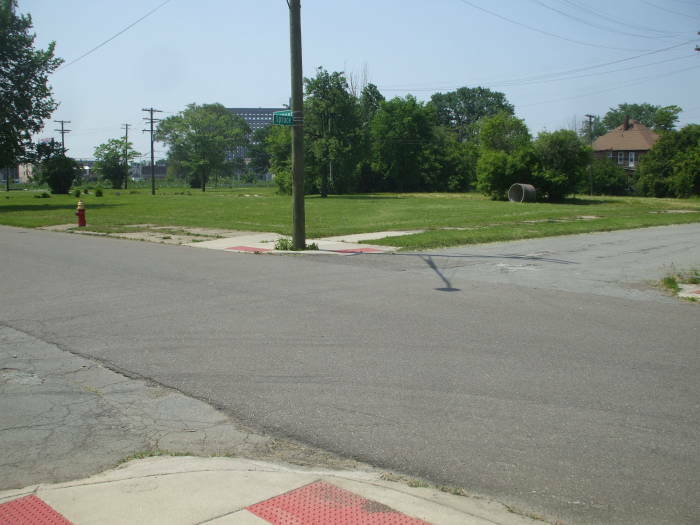 Archaeological work in the summer of 2011 found the remains of a hotel and homes in what is now Roosevelt Park in front of the station. The hotel dated from about 1912 through 1915. 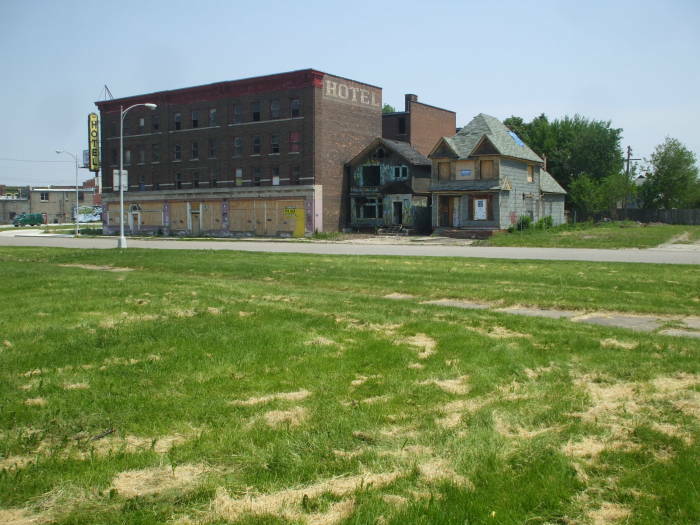 See the November, 2011 Archaeology magazine article "The Pre-Motor City". 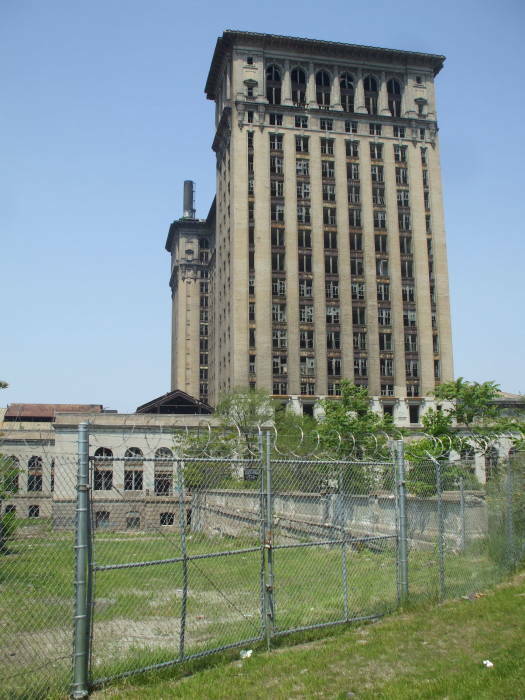 Some factions of the city government have been trying to get the Michigan Central Station demolished since 1994. 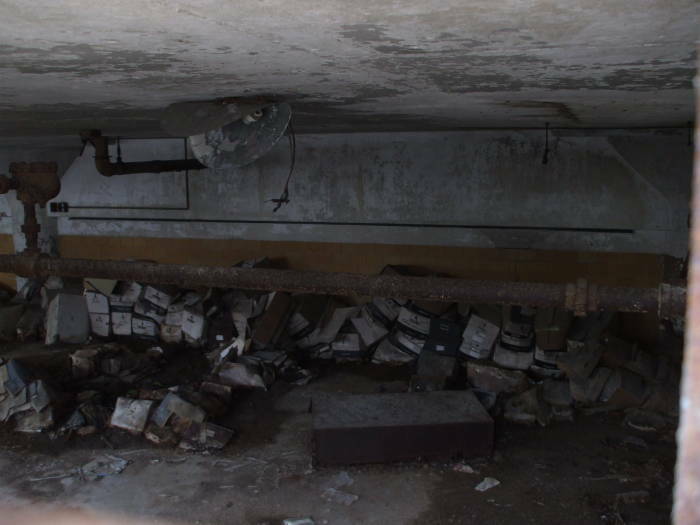 The station was inspected in detail in 2003, and found to be structurally sound. It had been designed and built to withstand the vibration of hundreds of trains pulling in and out every day. It was built in the early day of steel-reinforced concrete construction, and it may have been made even stronger than intended. 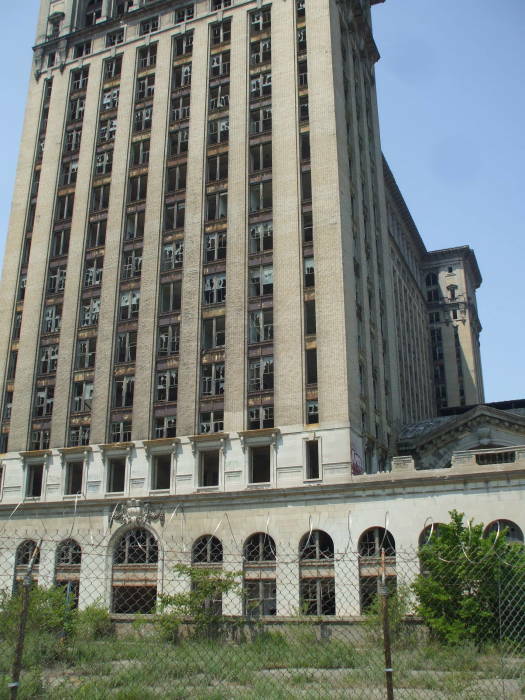 Recent plans or at least proposed concepts for the station have included a casino and hotel, the Detroit Police headquarters, the Michigan State Police headquarters, and a customs and international trade processing center due to its location near the Ambassador Bridge and the tunnel to Windsor. I read that more than 25% of all merchandise traded between the U.S. and Canada crosses that bridge, paying heavy tolls. A consortium including the Canadian Pacific Railway has proposed building a new and larger rail tunnel, large enough to carry large double stacked container cars, possibly increasing the need for a customs and trade processing center. Estimates of renovation costs have ranged from $80 million to $300 million.